What does the president’s slogan actually mean for the Philippines’ diplomacy? 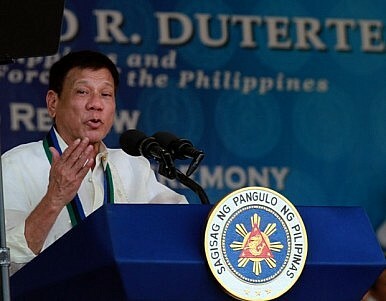 As he assumed control of the government, Philippine President Rodrigo Duterte announced that his administration would pursue an “independent foreign policy.” This pronouncement inspired debate on what an independent foreign policy actually means, especially in the context of the Asia-Pacific where there are tensions in the disputed South China Sea (SCS). Early in the Duterte presidency, administration officials provided rather general principles as to how such a policy would take shape. However, it was during a televised interview on April 3 that the new Philippine ambassador to China, Jose Sta. Romana, provided a more detailed explanation of the elements in Duterte’s independent foreign policy against the backdrop of the current dynamics of international affairs. It is the most comprehensive account of an independent foreign policy to come from a Duterte administration official thus far. The overall context of Philippine foreign policy is the emerging regional power shift in the Asia-Pacific. Sta. Romana argued that “what we are seeing right now is the rise of a power in Asia and we are seeing the decline of [a] power that used to dominate the region since the end of World War II.” Describing China not as a “superpower” but a “major regional power,” Sta. Romana noted Beijing’s neighbors have felt China’s rise as it seeks to expand power and influence in the region, particularly in the SCS. Mindful of the strategic environment, Sta. Romana identified the three major elements of Duterte’s independent foreign policy. First, in an apparent reference to president’s speech in China, is the “seperat[ion] [of Philippine] foreign policy from the U.S.” Sta. Romana was quick to point out that it “does not mean that we totally cut off from the U.S.” Rather, it means lessening Manila’s dependence on Washington while maintaining the “historic alliance with the U.S.” Second, an independent foreign policy requires “improvement of relations with China.” Finally, Sta. Romana emphasized “the improvement of relations with non-traditional partners,” including Russia, Japan, and India. In other words, as I have argued elsewhere, the Duterte government appears to be pursuing a hedging strategy. Except during the Benigo Aqunio administration, the Philippines — like many Southeast Asian countries in the post-Cold War era — adopted this approach, albeit to varying degrees. The scholar Cheng-Chwee Kuik defined hedging as “an insurance-seeking behavior under high-stakes and high-uncertainty situations, where a sovereign actor pursues a bundle of opposite and deliberately ambiguous policies vis-à-vis competing powers to prepare a fallback position should circumstances change.” The objective of this approach is to “acquire as many returns from different powers as possible… while simultaneously seeking to offset longer-term risks.” It is apparent that Duterte’s independent foreign policy appears to be governed by the tenets of hedging, especially in the SCS. Indeed, the Philippine government has not dismantled the legal foundations of the alliance. In fact, under Duterte, the facilities under the Enhanced Defense Cooperation Agreement will be constructed in the “agreed locations.” And, with some modifications, the Balikatan Exercises will continue. Together with the enhancement of Philippine military capability, maintaining the U.S. alliance is Manila’s attempt to offset long-term risks — a goal of hedging. Arguably, strengthening relations with other countries like Japan, as well as ASEAN, may be regarded as part of offsetting risks. As Sta. Romana argued, “you have to combine engagement with deterrence” with respect to China. “Forging an independent foreign policy,” Sta. Romana admitted, “will not be an easy task.” Without a doubt, implementing such foreign policy — underpinned by a hedging strategy — demands a delicate balancing act in an evolving regional security environment. Mico A. Galang is a researcher at the National Defense College of the Philippines (NDCP). The views expressed are of the author’s alone and do not necessarily reflect the official position of NDCP. Despite Duterte's outreach to China, the latest National Security Policy still sees maritime disputes as the top concern.